The long awaited christening of Prince George of Cambridge was held yesterday at the Chapel Royal at St. James’ Palace. It was a subdued affair, with only a handful of royals (the Queen, Duke of Edinburgh, Prince of Wales, Duchess of Cornwall, Prince Harry, and the Cambridges) and a few guests including George’s seven godparents (Zara Tindall, the only one from the royal family, plus Jamie Lowther-Pinkerton, William van Cutsem, Earl Grosvenor, Oliver Baker, Julia Samuel, and Emilia Jardine-Paterson). The Duchess of Cambridge wore Alexander McQueen – no surprise there – in cream and ruffles to match her son. Her outfit is bespoke (no surprise there either) but has some similarities to existing McQueen pieces. She finished the outfit off with a Jane Taylor hat. 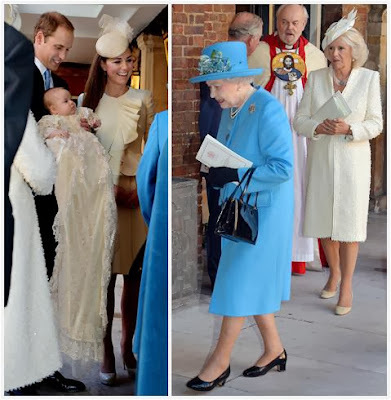 The Queen wore a simple sky blue ensemble (plus a brooch, naturally, and you can read more about her choice at the Jewel Vault) and the Duchess of Cornwall went for texture in her cream bouclé coat. Elegance all around, right? Both duchesses look fab – this could end up being Kate’s best of the year for me – and the Queen’s uniform is her uniform precisely because it is always right. Not a dubious choice in the bunch. Well played, Windsors. Pictures galore at the Daily Mail. Article and more from the BBC. Picture special from the BBC. Article and gallery from the Mirror. UPDATE: Official pictures are in! Click here for the set and an article from the Express. P.S. : Our regular Tiara Thursday feature will come tomorrow.